Funeral homes and other businesses are coming up with more personal and creative ways to commemorate deceased loved ones with send-offs to reflect the life that was lived, sometimes even with a bang. From artistic personalities to undying cases of wanderlust, there are a growing number of ways that people can memorialize a loved one after death. A garden bed might turn into the final resting place for the eco-conscious deceased, thanks to a proposed program in Seattle. Katrina Spade helped devise the Urban Death Project that aims to create a human composting facility that would allow people to turn the deceased into nutrient rich soil. The nonprofit wants to build a three-story structure that would allow the deceased to turn into compost within six weeks. At the end of the six weeks, families could use the nutrient rich soil to grow something new. "You'd lay your loved one into woodchips and sawdust; that would be the moment you say goodbye, " Spade told ABC affiliate KOMO-TV in Seattle. "Then a month and a half later, take some soil away and have another ceremony of your own, maybe grow a tree with your loved one's soil." The first display of a new Firework Memorial program, a partnership with AM Pyrotechnics in which fireworks are manufactured with cremated remains. You know the old joke of a funeral being the party your friends throw for you when they know you can’t attend? Well some of those parties may get even more celebratory now that funeral home directors are arranging for cremated ashes to be packed into fireworks. "It explodes with a lot of beauty and covers a lot of the sky, the size of a football field, " said Aaron Mayfield, owner of Illinois-based fireworks company AM Pyrotechnics. "It spreads the cremated remains into the sky and the particles are taken into the wind." A pleased client picks up the portrait of his late husband painted with traces of his ashes. Ashes can be mixed into custom paints and used to create a truly unique work of art in memory of the loved one. Portraits of the deceased are a clear choice, but landscapes and abstract scenes are also popular. Adam Brown, a Missouri-based painter who creates such paintings, told ABC News that he believes this is a less-morbid way of keeping the loved one’s memory present in day-to-day life. "It just kind of hit me that having ashes in an urn is a good way to remember that someone died but having them in a piece of art is a good way to remember that someone lived, " he said. Algordanza Memorial Diamond is specially created from the cremation ashes received from the family. Forget "ashes to ashes, dust to dust." How about "from dust to diamonds"? 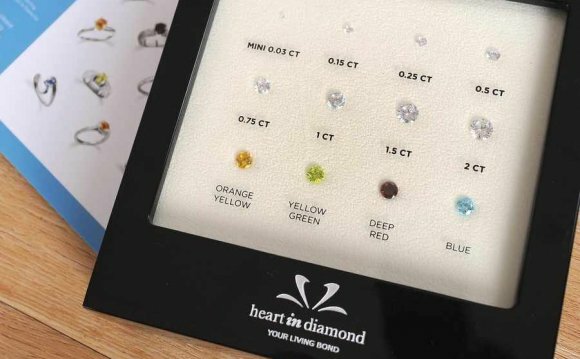 LifeGem, based in Elk Grove Village, Illinois, calls itself the original inventor and says it holds the U.S. patent for memorial diamonds. Each year the company has "generally about a thousand customers worldwide, " a spokesperson from LifeGem told ABC News. In this Dec. 17, 2013 file photo, an urn containing the ashes of C.J. Some see death as a chance to help a loved one see places they weren't able to reach during their lifetimes, including outer space. That was the plan for one grieving Maine mother, Hallie Twomey, who mailed hundreds of packets of her son C.J.’s ashes to people she met through social media who agreed to scatter them in various places that he was never able to go during his lifetime. The most eternal optimists (or truly dedicated Red Sox fans who want to follow in Ted William’s footsteps) can opt to forgo the cremation process and have their remains frozen in the hopes that their body could be revived when medical advances warrant, rather than burning all prospect of a physical return through cremation. Since its inception, the Cryonics Institute has housed nearly 200 “patients” (they don’t call them bodies even though they’re all dead) in their Michigan warehouse. Each body costs $28, 000 to freeze and store until it becomes possible to thaw and somehow revive them. What can you do with human ashes?